I picked an apropos headline since were are upon a historic midterm Election Day. But the people who actually live in DC are probably much more concerned with the quarterback situation. 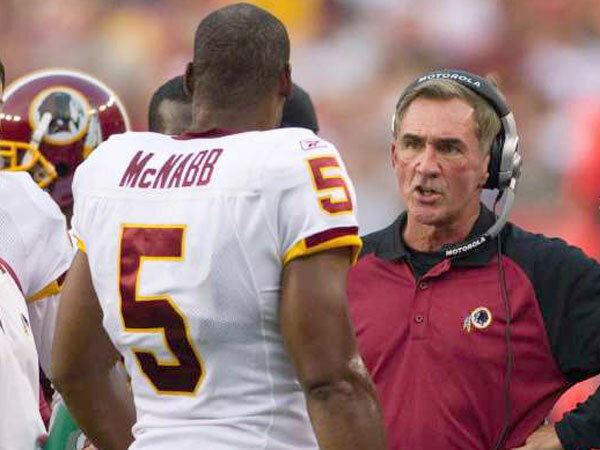 Mike Shanahan had the guts this past weekend to pull potential Hall-of-Fame QB Donovan McNabb, saying he was poorly conditioned and lacked the "cardiovascular endurance" to run the 2-minute drill in a comeback situation in Detroit. Personally, I have loved McNabb since he set foot on the Syracuse campus. He is the most prolific quarterback in Syracuse history, and Philadelphia Eagles history as well. But Shanahan is right, highlighting McNabb's lack of fitness. It was something that Andy Reid didn't address until trading the face of the franchise within the division. So maybe he said it without saying it. And I don't believe that McNabb is poorly conditioned, per se. But I think he has a condition. I remember him burning clock in a big comeback spot against Miami so he could catch his breath in the huddle. Syracuse came up short in that game 38-31 and the game ended on the 1-yard line. I remember another game where he suffered in the same situation, and actually threw up on the field minutes before throwing the winning TD pass against Virginia Tech. And what Eagle fan can forget the Super Bowl loss to the Patriots, when the Eagles could not rally fast enough down the stretch because McNabb couldn't keep up? McNabb's accomplishments in the NFL speak for themselves, but now Shanahan knows his limitations as well. And unlike Andy Reid, he won't have an invested fan base to piss off if he yanks McNabb in a similar circumstance. And Washington will have to prepare for a change in its leadership structure.